This is the Caterpillar 3406E and Eaton transmission for the new truck. The engine and flywheel housing is Yellow Heart, alternator is oak, and valve cover, transmission and belt is Gaboon Ebony. Just need to give it a coat of clear. Looks like it should power it with plenty to spare. Done a good job crafting it. I wondered what sort of truck you would be putting this monster in thinking, ... 340 Hp or thereabouts in a Hot Rod truck will be rolling coal in a big way, then I checked out your projects and its possibly going to be a very Big truck! Most impressive work you ave done there, on them all. At first sight – what is this, than realised detailed work on engine. Very nice. Great looking donk, HottieR. Can only wonder what else you’ll be hiding under the hood! Nicely done, I like the choice of wood combo, will be a great addition to a semi. This is a beautiful detail of a fine model. It shows a lot of care and quality. Robscastle, it will be similar to the first Pete I built, with a few more custom touches and a 3rd axle. The trailer will be a detachable gooseneck triple axle lowboy. Kicking around a few ideas of what will be on the lowboy, maybe something like this? I am guessing its a pile driver for building footings? ...are you building a new shed/shop? If that’s a pile driver… I’d hate the bill for the hemorrhoids paste! Robscastle, it is actually a pylon drilling machine. The company that builds this machine is a customer of the company I work for. 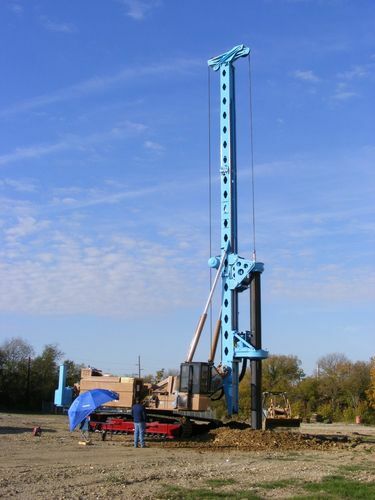 It can drill up to 120 ft deep and can drill a hole from 1-10 ft diameter hole. I test engines for a John Deere engine distributership. I wish I was building a shop. I had the notification for this engine but when I went to look it wasn’t there, glad I found it as it looks good, well done sir!! I agree with htl… Looks great and no oil leaks! That’s a good thing LOL!